Nathan Pollard of Phantoms is denied by a full-length diving tackle by a Basingstoke defender. Photo: Paul Young, Nene Digital. Peterborough Phantoms continued their fantastic season last night by reaching the final of the NIHL Division One South play-offs. Petr Stepanek of Phantoms celebrates a goal against Basingstoke. Photo: Paul Young, Nene Digital. The city men saw off Basingstoke – the side they also beat to lift the NIHL South Cup last month – 8-5 on aggregate, backing up a fine 3-2 Saturday (March 30) comeback success in Hampshire with a 5-3 verdict last night (March 31) at Planet Ice. Their reward is a final date against Bracknell, who shocked league champions Swindon in the other semi, this weekend. And both Phantoms and the Bees then advance to the NIHL Final Four where the top two sides from the South do battle with their equivalents in the North – Hull and Sheffield – over the weekend of April 13/14 in Coventry. “To be through to the conference final and then be going Coventry is another great achievement from a great group of guys,” said Phantoms head coach Slava Koulikov. James White scores for Phantoms against Basingstoke. Photo: Paul Young, Nene Digital. “They have been outstanding this season and they battled really hard in both legs of the semi-final. “Everyone from our netminder, who was amazing when keeping us in the first leg on Saturday, the D-men and forwards - including the young guys who have grown so much - has been fantastic. “I have to give huge credit to Basingstoke, but there is no doubt in my mind we deserved to win over six periods of hockey. Phantoms ceolebrate James Ferrara's goal against Basingstoke. Photo: Paul Young, Nene Digital. Phantoms hit home ice with the aggregate advantage last night and they soon extended it thanks to a beautifully executed opener on the powerplay. Slick passes from Ales Padelek and James Ferrara carved out the opportunity for Will Weldon to slot past Bison netminder Alex Mettam. But Phantoms’ advantage on the night proved to be short-lived as George Norcliffe levelled when steering in an initial Russ Cowley effort. Captain Ferrara missed a glorious chance to restore the city side’s advantage when left unattended at the back door, but they did hit the front again late in the opening session when defenceman Scott Robson seized on a loose puck to strike for the second successive night. There was still time for both netminders to make smart saves before the buzzer and the action continued a pace in the second period with Bison player-coach Ashley Tait firing wide of a gaping net early on. That golden chance arrived at the start of a spell of persistent pressure from the visitors which was broken when Padelek exquisitely created a third Phantoms goal for Ferrara. The sides then traded goals towards the end of the middle stanza with Richard Bordowski punishing defensive sloppiness to briefly drag Basingstoke back into contention only for James White to produce a fine reply for Phantoms little more than a minute later. It meant Koulikov’s men went into the final period with a three-goal cushion on aggregate and they never looked like surrendering it. There were a few nervy moments late on as Bordowski’s second of the night was almost immediately followed by a Bison powerplay in which Phantoms frequently had to put bodies on the line. But they sealed victory as the visitors final throw of the dice backfired. Petr Stepanek rolled the puck into the empty net inside the final minute and only seconds after Mettam had been pulled. 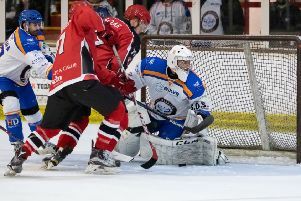 Basingstoke’s hopes of silverware departed with their goal-tender, but for Phantoms the fabulous 2018/19 journey continues.